We bet you've never had watermelon like this... Before the summer ends, make this amazingly fun and delicious dessert. It's perfect for warm-weather cookouts! In a medium bowl, mix yogurt, whipped topping, sweetener, vanilla extract, and salt. Spread yogurt mixture over both watermelon slices, leaving 1/2-inch borders. Top with strawberries and blueberries. Slice into wedges. 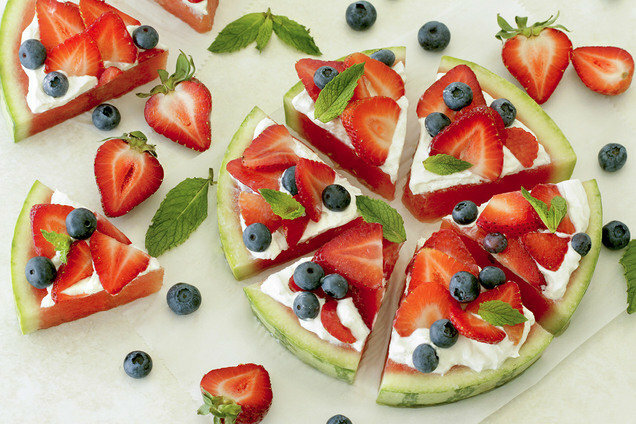 Hungry for More Healthy Summer Desserts? Get the party started... Just click "Send to a Friend" or forward the recipe!